In 1996, the Harbor Historical Association launched a dream to create a museum that would celebrate the maritime history of South Carolina and Georgetown, the state’s second largest port. In 2011, with community support, the South Carolina Maritime Museum opened on the waterfront in historic downtown Georgetown. 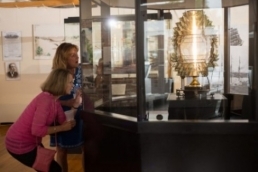 Home to the prized Fresnel lens of the old North Island lighthouse, our mission is to create enjoyable experiences for both young people and adults by featuring exhibits, programs and events related to South Carolina’s rich and remarkable maritime history. Join / Renew Your Membership Today! Please join us Wednesday, April 17, 2019 at noon for a program about the D-Day Mapping Project with underwater archaeologist Ralph Wilbanks. Ralph was involved in charting the lost ships and equipment off the WWII invasion coasts of Normandy. This extensive exploration discovered over 200 shipwrecks, many tanks, personnel carriers, and much more. Ralph is the principle investigator and owner of Diversified Wilbank’s Inc., and has over 35 years of experience in underwater archaeology. He has worked all over the world in search of history’s lost maritime treasures and is an advisory board member of Clive Cussler’s NUMA (National Underwater and Marine Agency). The South Carolina Maritime Museum invites you to usher in the coming of spring and the arrival of boating season at the 8th Annual Burning of the Socks on Thursday, March 21, 2019 from 5:30 pm until 8:30 pm. In addition to the sock burning festivities, there will be Cajun Gumbo, raffles and door prizes, beer, wine, liquor, and live music by John Lammonds and Robert Steuer. 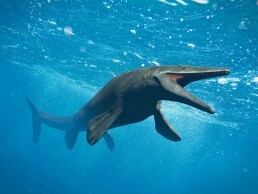 Beneath the dark waters of South Carolina’s Lowcountry waterways lie the fossil remains of creatures so fantastic, so seemingly mythical, that it’s hard to believe that they once roamed our landscape. South Carolina’s fossil record is both abundant and unique. Fossils, our link to this ancient past, have been found for centuries in the Lowcountry. From coastal beaches, to black water rivers, exposed river banks and road cuts, and in quarries, fossils can be found everywhere along and near the ocean. From the large to the small, Beneath Dark Waters presents just a sample of the wide variety of fossils to be discovered. Are you ready to learn more? Join us as we explore what lies beneath South Carolina’s Lowcountry waterways! On the bottom of the ocean off of South Carolina’s coast and along the banks of its many rivers are resting places for hundreds of shipwrecks. 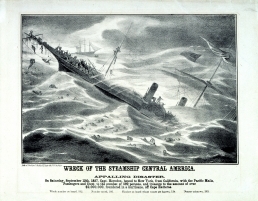 Artifacts collected by divers, beautiful ship models and historic photographic images tell fascinating tales of war, storm, collision and neglect at South Carolina Maritime Museum’s “Shipwrecks” exhibit. The fascinating “Shipwrecks of South Carolina” exhibit is displayed on the newly renovated second floor of the museum and can be viewed Monday through Saturday from 11 am until 5 pm. Admission is free. Donations are appreciated. A wall of nearly 300-year-old bricks recovered from the BROWN’S FERRY VESSEL (c. 1730) is a focal point in the newly renovated and expanded SC Maritime Museum. The purchase of a BROWN’S FERRY brick is a rare opportunity to “truly” be part of the SC Maritime Museum. 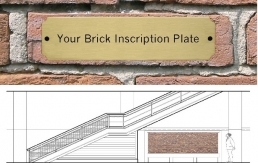 A historical brick with a commemorative inscription of the donor’s choice can be purchased for $200. You can purchase your brick online or call Amy Rowe at the SCMM, 843-520-0111. Bricks: $200 each, tax deductible donation to the Raise the Sails Appeal. Maritime Park, Georgetown SC’s newest outdoor waterfront event and wedding reception venue, is now available to rent! This venue is situated in the heart of Historic Downtown Georgetown overlooking the Harborwalk and Sampit River making it a beautiful stage for your next event. The Park is managed by Atlantis Property Management. 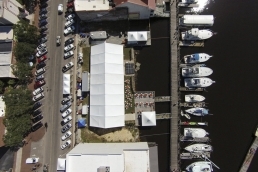 Please click on the link below to visit the SC Maritime Park website for contact info, rates, FAQ’s and event planning resources.